The outlook for troubled Serbian national carrier Jat Airways has improved significantly following the recent signing of an agreement with Etihad Airways. The partnership will allow the modernisation of Jat’s fleet and changes to its network, while also closely working with Etihad to improve its efficiencies, revenue management and cost reduction measures. Abu Dhabi-based Etihad is also negotiating to acquire an equity stake in the small Serbian carrier with a deal expected to be announced on 22-Jul-2013. If consummated, this will be Etihad's sixth equity arrangement, following those with Aer Lingus, airberlin, Jet Airways (pending), Air Seychelles and Virgin Australia. Jat’s partnership with Etihad comes after years of losses and multiple restructuring attempts for the Serbian carrier, a common feature among the countries of the former Yugoslavia (EX-YU). The other national carriers in these countries are also struggling and are attempting to restructure in an effort to make themselves more attractive to potential strategic investors. As Serbia’s national carrier and sole scheduled airline, Jat Airways plays an important role in providing international air transportation to Serbian citizens. Serbia’s scheduled air transport market is purely international and operates mainly from the capital’s Belgrade Nikola Tesla Airport in northern Serbia and from Nis Konstantin Veliki Airport in southern Serbia. Domestic air transportation in Serbia is only provided by multiple charter and air taxi operators. About 20 foreign carriers, including six LCCs, currently serve Serbia from across Western and Eastern Europe and the Middle East and Africa. The 21 carriers currently operating scheduled flights in the Serbian market, including Jat Airways, currently provide around 110,000 weekly seats to mainly other European destinations. The 20 foreign carriers operate to Serbia from 17 different countries. 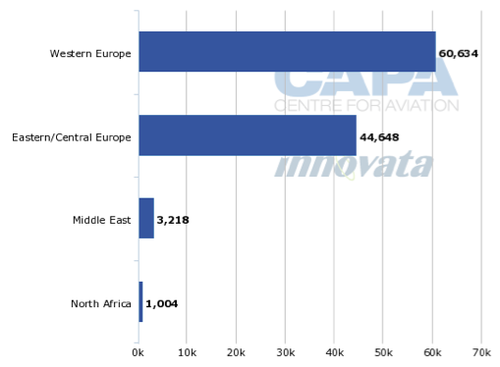 About 55% of capacity to and from Serbia is attributed to Western Europe, followed by 41% to Eastern Europe, 3% to the Middle East and 1% to North Africa. About 99% of the country’s scheduled capacity is at Belgrade Nikola Tesla Airport with the remaining 1% at Nis Konstantin Veliki Airport. Jat Airways is the leading carrier in the Serbian market, accounting for about 48% of the country’s capacity, followed by Wizz Air and Montenegro Airlines, which account respectively for 14% and 8% of capacity. While there is a large variety of carriers operating to Serbia, one airline noticeably absent from the market is Ryanair. It is perhaps just a matter of time until Europe’s largest LCC enters the Serbian market, considering Ryanair currently operates to five countries bordering Serbia (Montenegro, Croatia, Hungary, Romania and Bulgaria). The six existing LCCs operating in the Serbian market (Wizz Air, Pegasus Airlines, Norwegian Air Shuttle, flydubai, easyJet and Germanwings) combined account for about 21% of total capacity in the Serbian market. Etihad Airways and the Serbian Government signed an initial MoU on 17-Jun-2013 to discuss an equity investment in Jat Airways. If finalised the investment will reportedly amount to USD50 million. The airlines have said they plan to discuss further integration of their networks and collaboration to improve Jat Airways' efficiencies, revenue and cost reduction measures. The proposed investment would depend on the successful completion of a comprehensive due diligence process and be subject to regulatory and board approvals. Jat would be the sixth carrier in Etihad’s “equity alliance”. Over the past two years, the carrier has acquired equity stakes in airberlin, Aer Lingus, Air Seychelles and Virgin Australia and is now in the process of acquiring a stake in India’s Jet Airways. All the partnerships have also included codesharing. In addition, Etihad has started to pursue joint purchasing initiatives with some of the carriers in its equity alliance and is exploring a potential joint aircraft order with airberlin, Air Seychelles and Jet. As is the case with tiny flag carrier Air Seychelles, Jat could particularly benefit from joint purchasing opportunities as the small Serbian carrier would otherwise not be able to enjoy the economy of scale that give larger European airline groups a competitive advantage. Local media in Serbia have since reported that the Serbian Government plans to accept Etihad Airways’ proposal to acquire a 49% stake and take over operational control of the airline. The deal reportedly will be signed on 25-Jul-2013 ahead of Etihad formally taking control of Jat in Aug-2013. Amidst negotiations with the Serbian Government, Etihad Airways launched daily Abu Dhabi-Belgrade service with A319s on 15-Jun-2013. The route saw the start of codeshare cooperation between Etihad and Jat Airways, ahead of plans by the two carriers to expand their codeshare network to more than 40 destinations. Mr Hogan said at the time of the signing of the MoU that Jat Airways would also codeshare with Etihad’s equity partner airberlin, connecting Belgrade with Chicago via Berlin. As part of Jat Airways’ agreement with Etihad Airways, it has been reported the airline will rebrand to become Air Serbia from 27-Oct-2013. This will come after 66 years of being referred to as JAT (Jugoslovenski Aerotransport) since its renaming in 1947 from Aeroput. The airline added the ‘Airways’ to its branding in 2003 to become Jat Airways. The airline is one of the oldest in the world, recently celebrating its 86th anniversary of operations. The rebranding will represent a fresh start for the carrier with a new brand, new livery and new aircraft operating on new routes. Under Jat Airways’ agreement with Etihad Airways, most of Etihad’s USD50 million investment into the carrier will reportedly be used to renew the airline’s fleet. 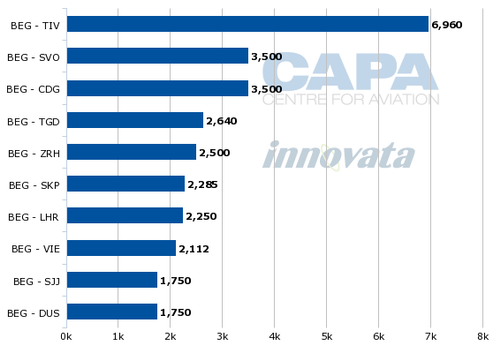 Jat’s fleet of 10 Boeing 737-300 aircraft, which currently have an average age of 27 years according to the CAPA Fleet Database, will be replaced with nine A319s. Two A319s are scheduled for delivery in 2014, four in 2015 and two in 2016. Jat’s turboprop fleet, which consists of four ATR 72s, reportedly could be replaced with Bombardier turboprops in 2014. The existing fleet has an average age of 22 years, though this has been reduced with the recent leasing of one newer ATR 72-500 to supplement three ATR 72-200s. The ATR 72-500 was leased from Nordic Aviation Capital, effective 27-Jun-2013. Jat also expects to soon take delivery of a second ATR 72-500 from Nordic Aviation. 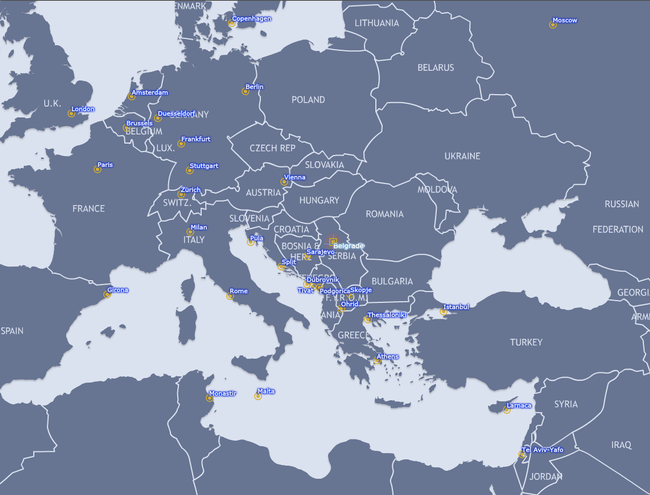 Jat currently serves 33 destinations from its Belgrade hub, including 31 in Europe, one in Africa and one in the Middle East. Etihad will particularly be able to leverage the carrier’s strong network in the EX-YU region. Tivat in Montenegro is Jat’s largest route and is served with six daily flights. Podgorica, also located in Montenegro, has three daily flights. Skopje in Macedonia is served with two daily flights and Sarajevo in Bosnia and Herzegovina once daily. A second destination in Macedonia, Ohrid, is served with five weekly flights. Jat also flies to three Croatian cities – Dubrovnik, Pula and Split – with four to five weekly flights to each destination. Etihad’s online network currently does not include any destinations in Montenegro, Macedonia, Bosnia and Herzegovina or Croatia. The UAE flag carrier will be able to use Jat to increase its presence significantly in the EX-YU region and offer connections via Abu Dhabi to destinations throughout the Middle East, Africa and Asia-Pacific. The feed from Etihad should allow Jat to expand in these markets, giving it an important competitive advantage over other carriers from the region. Currently about one third of Jat’s seat capacity is allocated to other EX-YU countries. While direct services to Western Europe will probably be maintained (Paris, Zurich, London Heathrow, Frankfurt and Dusseldorf are all among Jat’s top 10 routes), Jat growth under Etihad management will more likely be focused on regional services. Jat already is the largest of the flag carriers based in the EX-YU region and offers more capacity within the region than any other carrier. Meanwhile, despite talks in 2012 over potential closer cooperation between Jat Airways and other national carriers of the countries of the former Yugoslavia, there has been no closer cooperation. As previously reported by CAPA, in the midst of the Jat Airways’ restructuring in 2012, Association of European Airlines' (AEA) then-secretary general Ulrich Schulte-Strathaus stated that national carriers in the former Yugoslavian countries of Bosnia and Herzegovina, Croatia, Montenegro, Serbia and Slovenia needed to unite into a single carrier in order to survive. The airlines that were urged to unite included Jat, Bosnia and Herzegovina’s B&H Airlines, Croatia’s Croatia Airlines, Montenegro’s Montenegro Airlines and Slovenia’s Adria Airways. Since the discussions over potential closer cooperation between the carriers, the airlines have just continued on with their own restructuring and privatisation programmes. Jat’s success at securing investment from Etihad provides a dual scenario. On one hand it may offer a glimmer of hope to other carriers in the EX-YU region and their governments – although there are clearly not enough suitors for all these carriers. Another assessment could mean that a now strengthened Jat, feeding into and supported by Etihad's system, will start to digest the traffic from other markets, offering a better product and making life even more difficult for the other states' airlines. All of the flag carriers from the small EX-YU states still face huge challenges, making consolidation perhaps the only option, short of a worse alternative. Moreover, the economies of some of these states, suffering from substantial debt overhangs, do not augur well for air travel. Jat Airways’ cooperation with Etihad Airways is not a unique arrangement. Similar cooperation involving carriers in the EX-YU region has occurred in the past. In late 2008 Turkish Airlines reached an agreement with the Government of Bosnia and Herzegovina to acquire 49% of B&H Airlines and to invest EUR5 million directly into the carrier, as well as another EUR5 million to cover the lease of two new aircraft. The agreement also included management assistance and codesharing between the carriers. The airlines cooperated until 2012, when issues arose between Turkish Airlines and the Government of Bosnia and Herzegovina over the management and performance of B&H Airlines. This led to Turkish Airlines’ 49% stake being taken over by the Government, the cancellation of the joint agreement and the suspension of the codeshare cooperation. The issues Turkish encountered in Bosnia and Herzegovina highlight the challenges airline groups from outside the EX-YU can encounter when investing in airlines from the region. The agreement between Jat and Etihad is hopefully sufficiently positive for Jat Airways’ future and Serbia overall that any differences are more easily overcome. Etihad is now developing considerable experience and expertise in managing at both airline and government level; the Air Seychelles experience is a near model example of how these arrangements can become win-win (and win for the local economy). Without the new Etihad partnership, Jat faced a bleak outlook. So there is plenty of room for upside. For a country which relies heavily on its industrial production, minerals and agriculture, reliable and reasonably priced air services are an essential. Serbia is a relatively wealthy country with a population of 7.3 million and GDP per capita of around USD11,000, but suffers a very high level of unemployment at around 20%. Inflation too is well into double figures. As a standalone airline, Jat was always going to continue to struggle. Now, Jat will gain access to Etihad’s expansive network and have opportunities to pursue joint purchasing, which could lower its costs and allow it to leverage economies of scale. With its forthcoming rebranding, new livery and more modern aircraft operating on a revised network, Jat Airways will be in a much better position to turn around its financial situation and find a sustainable niche. For Etihad, which also announced its 46th codeshare on 15-Jul-2013, an expansive operational and FFP arrangement with Korean Air, the skies currently look very bright.